Stephen Williams Jr is a World Champion Magician based in Liverpool, who is available to perform both close up magic and stage magic at your next party, event or wedding. Having years of experience performing his original and astonishing magic at events and on television around the world (including in Tokyo, Japan for SONY and in Atlanta, Georgia for the Society of American Magicians), by hiring Stephen you know you'll be in safe hands; you'll be bringing something fun and amazing to your event; and you'll be giving you're guests a unique experience that is sure to make your party or wedding in Liverpool remembered for all the right reasons. Although Stephen performs his incredible magic internationally and is one of only a handful of full-time professional magicians working in the UK today, hiring him for an event in Liverpool or the North West means that you won't have to pay travelling expenses; and will be guaranteed to have one of the most popular and incredible magicians at your event to entertain your guests. As well as being a close up magician in Liverpool, Stephen is also a hugely popular stage magician - performing his unique and incredible magic show around Liverpool and internationally. If you're looking to hire Stephen for a stage or cabaret magic show, please get in touch using the details on the contact page. Contact Liverpool Magician, Stephen Williams Jr: Stephen's wealth of experience as a professional magician in Liverpool and around the world speaks for itself - so before even considering another magician, take a look at some of his previous achievements, found under Stephen's Experience section on the home page. No matter what the event, this award winning magician based in Liverpool is guaranteed to be the absolute perfect choice to entertain your guests; so to find out more and get a completely free, no obligation quote, visit the contact page to speak to Stephen today! 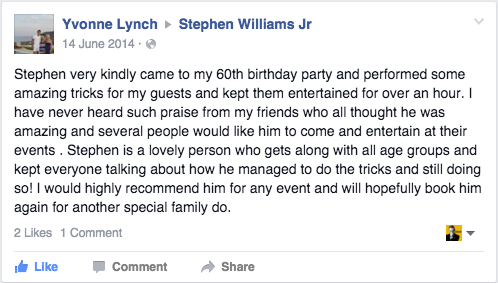 - Testimonial from Michelle Stacey for Stephen Williams Jr; Close Up Wedding Magician, Liverpool. - Testimonial from Gerard Hall for Stephen Williams Jr; Magician for Hire in Liverpool. - Testimonial from Peter Stoddart who hired Stephen as a Liverpool Magician, for his wedding.